Preventing and getting rid of blackheads is your first line of defense for a clear complexion. 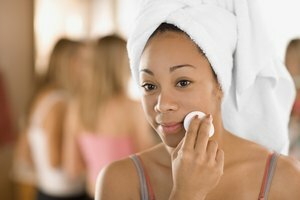 Steaming, cleansing and applying acne-fighting products regularly will usually do the trick. 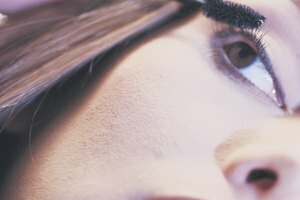 But when stubborn blackheads won't seem to budge, certain techniques and the right products allow you to look your best in the meantime. Purchase a creamy, liquid concealer made especially for your skin type, then simply cover your blackheads until they disappear. Wash your face with an acne-fighting cleanser. Choose a wash with ingredients such as glycolic, lactic and salicylic acids. Sulfur and benzoyl peroxide also work to kill bacteria, slough off dead skin cells, and keep oil and dirt at bay. Pump a dollop onto your fingertips and gently wash your entire face using small circles. Rinse off the cleanser by splashing warm water onto your face. Pat -- never rub -- your face dry with a clean towel. Scoop out a dollop of non-oily moisturizer onto your fingertips. Apply the cream evenly onto your face to provide a smooth base for the concealer. Look for a non-comedogenic facial moisturizer that won't clog your pores. Squeeze out a smaller-than-pea-sized amount of concealer, then dip a concealer brush into the liquid. Smooth the concealer over the area with blackheads using light brush strokes. Start with a thin layer to see whether that covers most of the blackheads; apply another thin layer if necessary. Squeeze a dime-sized amount of foundation into the palm of your clean hand. Swirl a flat foundation brush into the liquid. Dab and smooth the foundation into your skin in circles, making sure to cover your entire face. Dabbing -- instead of brushing -- the foundation helps to minimize streaks and better control the coverage. 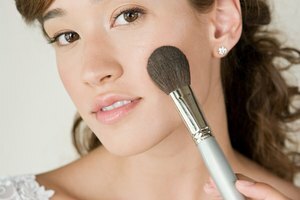 Dip a big, round makeup brush into a tub of powder. Shake the excess powder off by tapping the brush on the side of your sink. Lightly dust the powder on top of the covered area and around your entire face to set your foundation and concealer. Women should choose a concealer that is slightly lighter than the color of their foundation. Men, however, should choose a concealer that matches their skin tone. Choose the right foundation for your skin tone by swiping several shades above your jawline. Go outdoors and see which blends well with your skin tone. Make sure your powder is slightly lighter than your natural skin tone. I Have Oily Skin: What Face Soap Should I Use to Avoid Breakouts? Finn, Lisa. "How to Cover Blackheads." Synonym, https://classroom.synonym.com/cover-blackheads-18132.html. Accessed 20 April 2019.